Viega offers three main PEX tubing products: ViegaPEX, ViegaPEX Ultra and FostaPEX tubing. 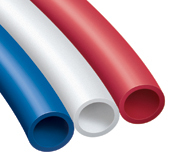 Unlike copper, all PEX tubing products from Viega offer proven resistance to aggressive water conditions and temperature aging for longer life expectancy. used in continuously recirculating hot water systems. Don't let the competition fool you. 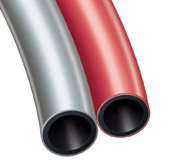 Viega pioneered the use of professional grade PEX tubing more than a generation ago. 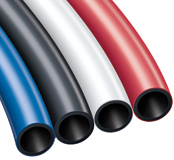 Viega Pex tubing is a high density cross-linked Polyethylene tubing (PEX for short). 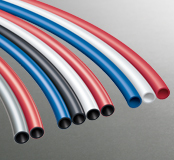 Although there are now many choices in PEX tubing, Viega PEX offers advantages over other tubing types. Viega PEX offers superior Chlorine resistance for continuously recirculating applications, plus excellent corrosion and freeze resistance, plus additional protection against UV rays. ViegaPEX Ultra provides exceptional protection against UV radiation from the sun for applications where tubing could be exposed to the outdoors for up to 6 months. ViegaPEX Ultra is also available in sizes from 3/8" to 2" for larger applications. Fosta stands for Form-Stable PEX, so the piping will keep its shape after it is bent. A distinctively versatile product, FostaPEX balances stability with flexibility to create a unique tubing system that not only bends with ease but also holds its shape. Outer layers of aluminum and PE make this feature possible, while simultaneously extending UV protection. FostaPEX is a lead-free oxygen barrier pipe, which makes it compatible not only with potable water systems but also in hydronic applications. FostaPEX also has a low coefficient of expansion compared to standard PEX products and, since one fitting system connects to all types of ViegaPEX tubing including FostaPEX, distributors need only one inventory and contractors need only one tool set.